The Title "How to Avoid Housework Tips, Hints, and Secrets on How to Have a Spotless Home" is written by Paula Jhung. This book was published in the year 1995. This book has total of pp. 214 (Pages). The publisher of this title is Simon & Schuster. We have about 37709 other great books from this publisher. 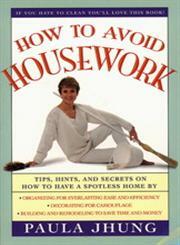 How to Avoid Housework Tips, Hints, and Secrets on How to Have a Spotless Home is currently Available with us.